Despite taking place almost entirely underwater and you’re swimming instead of walking, Abzu is still pretty much a walking simulator. At this point most gamers have already made up their minds on this sub-genre, so you’re either going to love it and appreciate it for what it is or hate it for what you think it should be (the usual complaint is that they aren’t videogame-y enough). Personally, I’ve become a big fan of walkingsimulators in 2016 and can say with confidence that Abzu is one of the absolute best. The underwater environments you explore and sea creatures that populate them are absolutely gorgeous and the soundtrack is simply incredible. It is also filled with jaw dropping moments that had a huge smile on my face the entire time I was playing it. 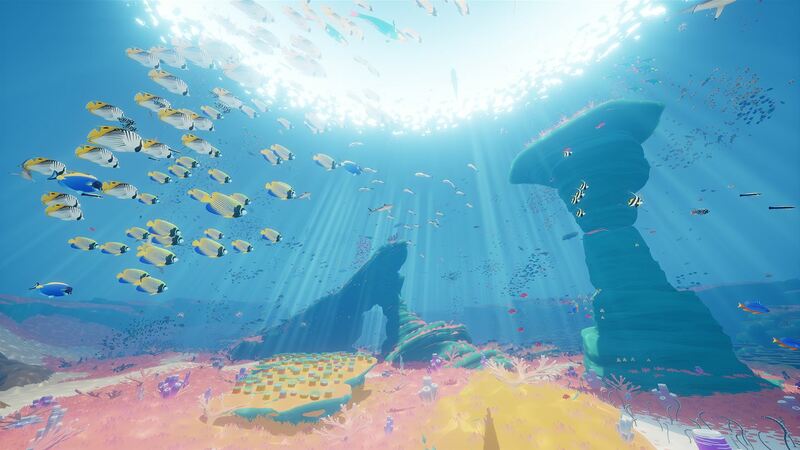 For all of the details continue reading my Xbox One review of Abzu. 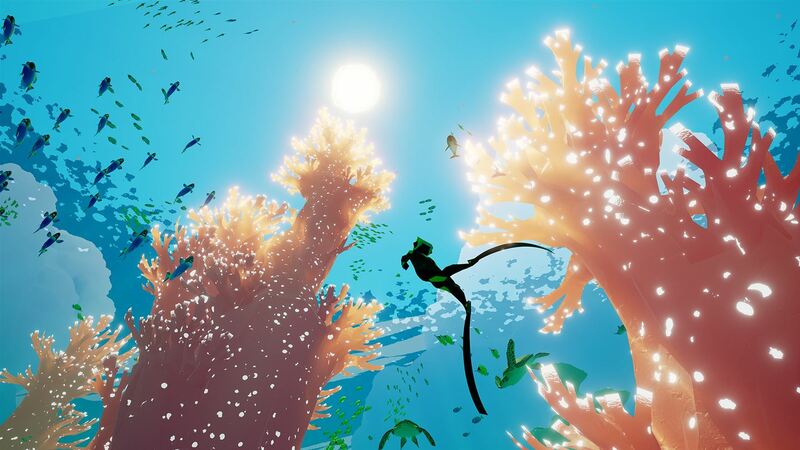 Abzu takes place in an underwater world where your character – basically a scuba diver but you don’t have to worry about air – suddenly just sort of wakes up while floating in the ocean. There is no story, and the game doesn’t really tell you where to go or what to do, but it is designed in an intuitive way so you just instinctively know what to do next. Similar to Lifeless Planet, you’ll see a blinking icon on a robot buddy you need to activate, or a suspicious looking rock or cave in the distance that draws your attention so you go and investigate and you always end up going in the right direction. I really like game design like this. The underwater world is filled with various types of real fish and sea mammals that include both current animals as well as prehistoric ones. It is always fun to enter a new area and actually recognize different species swimming all around you. You can swim through schools of fish and they’ll follow you around and spin and flip along with you as you play in the water and you an even grab onto the fins of lager fish and have them pull you around. It is all just really magical. Abzu doesn’t really have any enemies but it does take a bit of a dark turn the further you get into the game. The sea creatures stop being all cute and colorful and suddenly you start seeing angler fish and goblin sharks and giant squid and other deep, deep, deep sea nightmares. I was half expecting it to go full Ecco the Dolphin and an alien to show up, which actually isn’t too far off as you do find some alien technology that is sucking all of the life energy out of the sea. Dealing with this leads up to the game’s finale, so I won’t spoil it. It is important to note that Abzu doesn’t have any combat or any real threats to your existence. You’re just sort of along for the ride to point your diver in the right direction and see lots of very pretty scenery and experience some truly incredible moments. The controls are simple and intuitive as you hold the left trigger to swim, use the left stick to point your diver in the direction you want to go, use the “X” button to interact with things, hold the right trigger to grab onto fish, tap the “A” button for a speed boost, and press the “B” button to do a flip or spin while you’re swimming. It might sound boring, and to walking sim haters I’m sure it is, but I can’t emphasize enough just how incredible some of the moments you experience in Abzu can be. Every new area is a wonderland of beautiful things to look at and the sea creatures are absolutely the stars of the show. Swimming with dolphins and whales and giant sea turtles are some fantastic moments and the last quarter of the game or so is absolutely mind blowing. 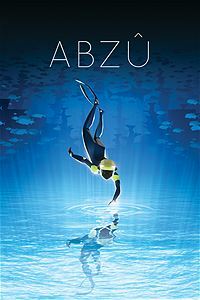 Abzu packs the whole gamut of emotions into a two-hour journey that will leave you breathless. My one and only complaint is that very short two-hour length and the fact it costs $20. It does have some replay value as there are some hidden collectibles to find and you’ll likely want to experience it more than once. Above all of that, though, I really feel like Abzu is a game that you’ll want to share with other people, both gamers and non-gamers alike. It is so beautiful and memorable and moving that it is just fun to watch and soak it all in. With that said, I still don’t exactly love the $20 price tag even as much as I do love it. Waiting for a sale is probably a wise move. As far as the presentation goes, Abzu is completely gorgeous. The game just looks insanely good with fantastic lighting, incredible models for all of the sea creatures, and a mostly bright and colorful palate that makes it a joy to look at. The orchestral soundtrack blends perfectly with what you’re doing, too, so calm and peaceful moments as well as fast and frantic ones are perfectly punctuated by the music. I would make a direct comparison to Disney’s “Fantasia” in how perfectly crafted the audio / visual presentation mixes to deliver a memorable experience. Abzu could pretty much be a Disney movie. I love Abzu. It is stunningly beautiful and so emotional and just a wonderfully memorable experience all around that I can’t wait to share with my friends and family. If you like walking sims and just want to play a relaxing and enjoyable and memorable game where you get to play around with colorful sea creatures, Abzu is easy to recommend. Abzu is a great kid game, too, because not only is it fairly easy to play but also it’s basically an interactive Disney movie. Without a doubt, Abzu is one of the best games of 2016.